c) what a strange cusp in time we are standing upon. I’d wanted a rocketbook for a couple of years before I could buy one. They started out as a $500 device, and I was temping as a library tech in law offices at the time. By the time RebaCon, the first and only rocketbook convention, was held in San Francisco, I was a dot-commer. I’d just come back from my first sailing trip, and went on a whim. I was hooked from the moment I held one. Being a bit more flush of money at the time, and the price being a far more reasonable $199, I called all the Barnes and Nobles in the area till I found one that stocked them. I drove down and bought one that night. I still have it. And it still works, as do the other two we own. Of course, it’s an antiquated device by now. I need a serial port to USB adapter to even plug one in. I need to maintain a windows partition on my mac to even use the software. I mainly do that out of sentiment, but it is still the best built and best thought out reading device in existence. It was built to do one thing, and one thing only: read text. It reads three formats; its own proprietary format, vanilla ASCII, and HTML. This makes it usable to this day. It came with the Rocket Librarian, a program that organizes its library of books and allows the user to convert anything in those two ubiquitous formats into rocketbook files. I readily admit I used it mainly as a fanfic tablet. Not only could it convert files from sites that stored such things into ebooks, it would also follow the links, if so directed, and render chaptered fics into one easily readable file. I could also get long articles from sites such as the old Salon.com and read them whenever I pleased. The Project Gutenberg library was mine for the reading, wherever and whenever I wanted. And then there was Fictionwise.com, a mere shadow of itself now that it is owned by Barnes and Noble, but back in the day it was the perfect partner for the Rocketbook. The good people who ran Nuvomedia were in it for the love of ebooks and they understood the full potential of the device. They knew that being able to put one’s own content on the device was vital, and they not only made that easy, they went as far as possible to make it useful. It wasn’t possible to actually edit files, but the bookmarking and note-taking features are better than those found on the current generation of ereaders. In short, they came as close as they could to making the PADD, the Star Trek tablet computer, as was possible back in the 1990s. 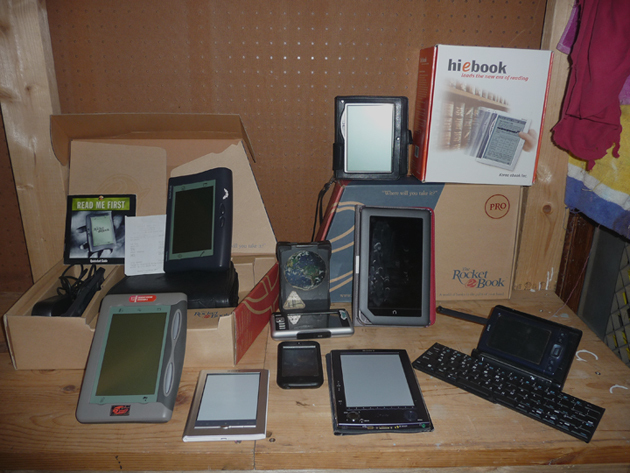 Going through that box, I realized just how much we’ve given up with the latest generation of reading devices. The people making them now are only in it for the money, and to be fair, actually bringing the ebook into widespread use probably required that mindset. Nuvomedia had to sell their device to a larger company in the end, and no vestige of the original device remains today. I do most of my ereading today on my iPod, or on a Nook Color. I don’t care for either, but they get the job done. The iPod is too small and the apps available, ever since ebook reader was hobbled by Apple and Barnes and Noble, don’t do the job nearly as well. The iPod, though, is always with me, and so I always have something to read. It also lets me check ebooks out from the public library, which I love and do often. The Nook unfortunately, is not only bulky, it’s also a direct open window to Barnes and Noble. They are so thoughtful, they keep track of everything for me, including my place in every book on every device. They open a wireless connection whenever they can, unless I actively turn wireless off. And they datamine my reading history and library, both to try and sell me content, and for whatever other purposes they so desire. While I can fill a certain tiny portion of the cavernous memory on the device with my own content, the lion’s share is locked in to Barnes and Noble. I didn’t realize this when I bought the device, Now that I know I will never buy another. A Kindle? More of the same. I have never, and never will own one of those. When I buy books today, I generally take the paper option if I intend to read the book more than once. The biggest problem with both Barnes and Noble and Amazon is that the user is effectively renting content. You can read whatever you bought on multiple devices, but you can’t close the pipeline. And you can’t take the content over to another app or program. Sooner or later, the content you paid full price for will be unreadable on any device available. I’m sitting in a room full of books right now. Paper and ink, of different shapes and sizes, the products of many minds, many of the volumes far older than I am. I can lend them to whomever I please, sell them or give them away. In time, if time is kind, they will be enjoyed by other people whose names and faces I will never know. I have nothing against ebooks. I have always wanted access to the libraries of the world from wherever I happen to be. To me that was, and is, the promise of the future. But sitting here, with the weight of knowledge heavy on shelves all around me, I wonder whether I will see free and unfettered access to the wisdom of the ages in my lifetime. The Amazons and Barnes and Nobles of our time only see what will sell, and what is current. Project Gutenberg is a David to their Goliath and in any case, can only archive what is no longer under copyright. We all know that David won, but how long will it take? What will be lost if we don’t maintain paper books, and libraries, long enough to get there? The Library of Alexandria burned, after all, and we are all the poorer for it. As long as I’m content using an Amazon app or a compatible device, that’s great. But that collection you see in the photo stretches back to the year 2000. How many of those devices will be compatible with an Amazon app? Exactly two; the iPod and the Nook. Going into the future, how many will be? I’m not willing to trust Amazon to keep diligently making sure that going forward, my content will remain retrievable. I’ve been through that before, from the Rocketbook on. My point is, Epub was created to be a universal format. But Barnes and Noble, Sony, and others have devised ways to lock it to their specific devices. They give us the illusion of freedom by providing apps that allow us to read content on other devices, and also require us to remain hooked into their respective clouds whenever we are connected to wifi. They also have the power to jerk content from our devices without our consent and Amazon has even done so before. A plain epub document is readable on more of my devices, despite its relative youth (the format became a standard in the middle aughts) than the locked files you can now buy from the major publishers. And if I really want to think long-term, the old ebooks I’ve saved in html, text, or even rich text are readable on most of the devices I have in that photo, plus any computer I’ve ever owned, and I can expect them to remain readable for a whole lot longer than any DRM-hobbled file I might buy now from Amazon or Barnes and Noble. I have access to the whole public domain Project Gutenberg library on any platform I choose, and will, probably for the rest of my life. Blessings on Michael Hart, he built something amazing before he left us! Now that is content I can put my trust in. For that matter, my Darkover novels, fragile though they are, are in a non volatile storage medium that has been trusted for hundreds of years. If I take responsibility for their storage and care, I can keep them till the acid-ridden paper falls apart. If I take the initiative to scan them and save them in the proper formats, future generations could even enjoy access to them. And really, how much does a paper novel cost to replace? And how priceless is the knowledge that I can read it forever, with no one looking over my shoulder, calculating their chances of selling me other books based on how fast I get through the thing? Previous Previous post: Growing myself into a better person. Growing the world into a better place.